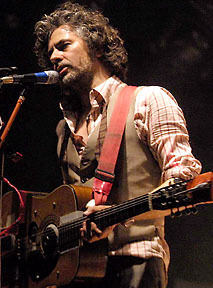 It's a weekend where camping overrides the comforts of home, non-stop live music takes the place of the mundane work week, and as Wayne Coyne of The Flaming Lips' said during a press conference, it's a time "to forget about the news, forget about what's happening on CNN and forget about politics." And that's exactly what over 80,000 faithful fans did at this sixth annual event, which seems to multiply exponentially with both artistic diversity and musical talent with every year that passes. 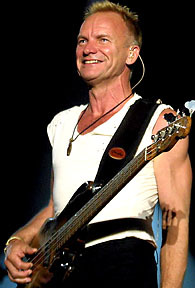 Not only is The Police's reunion the most prominent tour of this entire year, but Bonnaroo scored Sting and the boys for the headline slot Saturday night. And after two decades a part, the trio picked right back up where it left off as a razor-sharp rhythm section and punk-tinged reggae rockers. 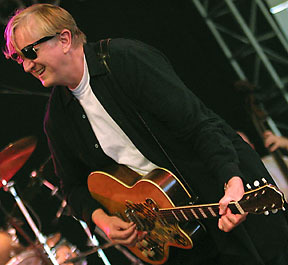 Almost all the hits were present, including the timeless "Message In a Bottle," "Spirits In The Material World," "Every Little Thing She Does Is Magic," "King of Pain" and "Can't Stand Loosing You." However, the momentous affair wasn't without a handful of drawbacks, including the Sting-styled sleepiness of jazzed down arrangements during parts of "When The World Is Running Down," "Wrapped Around Your Finger" and "Roxanne." 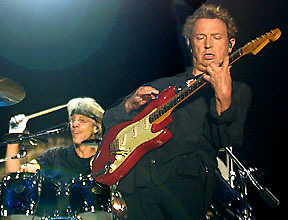 Yet he, along with drummer Stewart Copeland and guitarist Andy Summers, returned to their more rebellious roots come the aggressive encores "So Lonely" and "Next To You," which will hopefully carry over if the group returns to the studio. 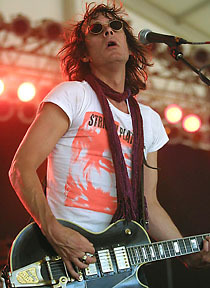 In keeping up with the sonic variety, Tool pummeled with hard rock intensity during its extensive Friday night romp. 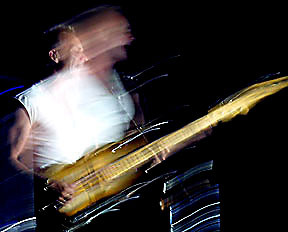 Though no visual record of the band's bone crunching performance is available because the group banned all press photography, it was quite a menacing site as Maynard James Keenan howled alongside fiery guitars and percussion over a sea of moody stage lights. The gang even scored a little help from its Rage Against the Machine/The Nightwatchman pal Tom Morello, who contributed to the back breaking version of "Lateralus." The top spots were rounded out Sunday by the hippie-pleasing Widespread Panic, the weakest of the three who unfortunately were slated to play the longest. 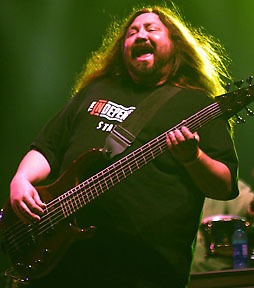 Faithful fans may have devoured an expansive three hour set, but the campgrounds quickly thinned thanks to throngs of casual observers hoping to avoid traffic jams, not to mention Panic's incessant, almost identical sounding instrumental jams. No matter who was placed at the top of the ticket, The Flaming Lips and The White Stripes dominated the weekend with respective jaw dropping sets. Coyne led the Lips through its most ambitious stage show to date, taking cues from Peter Gabriel at his most experimental. The singer made his standard but highly electrifying space bubble entrance, but rather than merely rolling into the crowd, he came down from the stage's ceiling in a giant aircraft that seemed straight out of a sci-fi flick. Of course the band's delightfully demented blend of atmosphere rock and dreamy pop was at its top tier, while a dancing Santa troupe and masked aliens kept the party atmosphere flowing long after the ship landed. 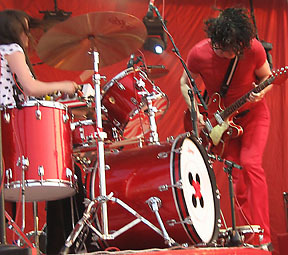 And while not nearly as over the top in display, The White Stripes presented a no nonsense, balls to the wall show that signaled Jack and Meg White's comeback of sorts, following the front man's foray with The Raconteurs. 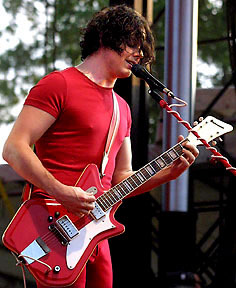 Aside from that landmark, the concert also kicked off the band's tour in support of it garage rock evolution Icky Thump (Atlantic), which was previewed to thunderous acclaim, along with many key catalogue cuts (including an incendiary encore of "Seven Nation Army"). 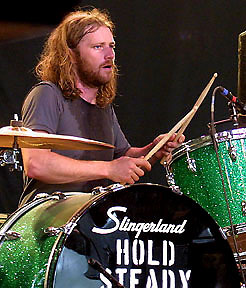 No matter where they play or in what format, several artists that appeared at Bonnaroo continued riding out their consistency streak. 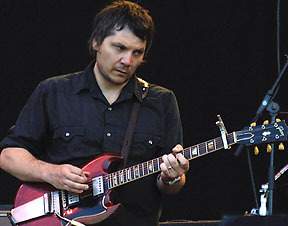 Leading that pack was the rootsy Wilco, who relied heavily on its excellent new organic/acoustic effort Sky Blue Sky (Nonesuch), along with guitar slinger T Bone Burnett, who's clearly shaken off the cob webs after a lengthy touring hiatus. 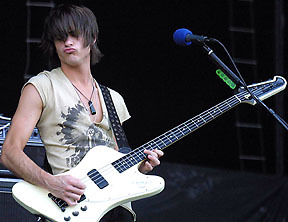 In swampy rock and roll contexts, Kings of Leon pummeled with sweat stained abandon, while The Black Keys took advantage of the southern setting to dive even deeper than usual into the blues. Power poppers Fountains of Wayne brought some guilty pleasure accessibility into the fold, including a tongue and cheek (though masterfully executed) medley of 80s covers that included The Cars, Foreigner and Kansas. 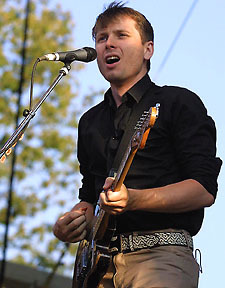 Franz Ferdinand revived the dance rock tradition of that era, also mixing garage rock and new wave nuances, while The Hold Steady hearkened back even earlier to merge gut wrenching guitars with grimy psychedelic influences. 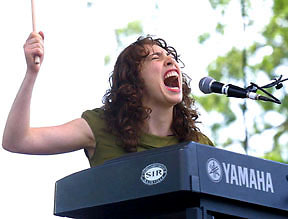 Relative newcomer Regina Spektor spent much of her time seated at the keyboard (with the occasional percussion pad at her side) to channel a naughtier version of Tori Amos, as cheerful pop chanteuse Feist demonstrated her softer side outside of Broken Social Scene. Electronica abounded a la Kraftwerk and New Order thanks to Hot Chip, while the John Butler Trio created a flavorful gumbo of blues, jazz and roots rock. 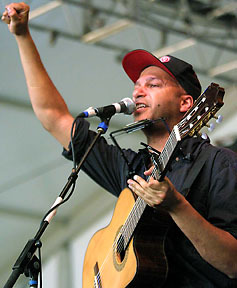 Morello also appeared in solo ranks under his new banner The Nightwatchman, which takes Rage's political cues, but presents them under an acoustic umbrella. Given his time in The Grateful Dead, Bob Weir and current band Ratdog were a hot attraction in hippie circles, though thankfully the noodling didn't get too out of control. The jamming also incorporated the rap and hip-hop spread of The Roots, who once again added urban grooves to live band arrangements. 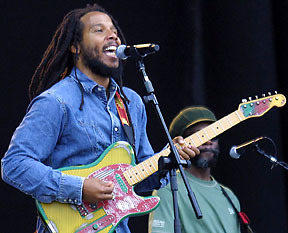 Reggae figurehead Ziggy Marley played his own set before sharing the spotlight with Ben Harper and the Innocent Criminals, who paid collaborative tribute to the late great Bob Marley. And speaking of famous offspring, the spirit of jazz giant John Coltrane lived on through his son via the exceptional Ravi Coltrane Quartet. 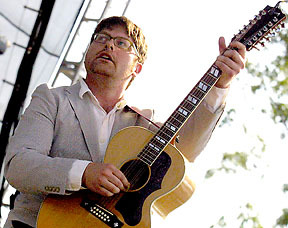 Even with the blazing sun and temperatures tipping towards a hundred, The Decemberists threw on its usual hipster garb, which included a sweat inducing full cotton suit from front man Colin Meloy. 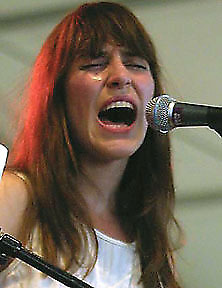 Aside from looking sharp, the group turned in a captivating set of songs from The Crane Wife (Capitol), which could be loosely compared an acoustic version of The Arcade Fire. 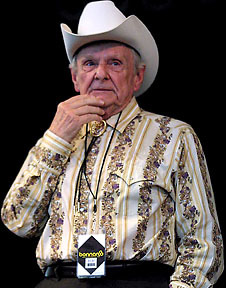 Classic country man Ralph Stanley was also unplugged, turning in a riveting set of spirituals made that much cooler by his old time cowboy outfit. 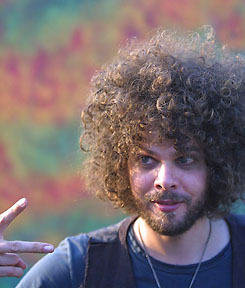 In leaning more towards the weather trends, Wolfmother ring leader Andrew Stockdale took off his shirt, displaying a chest full of hair that complemented his puffy head locks, making him look, well, quite wolf-like. And the ladies swooned over the shirtless Sting during The Police's encore, who continues to defy age by staying in peak shape. Unfortunately newcomer Lily Allen is trying to grow up too fast, hitting the bottle hard and allowing herself to stumble through shows as a result. The rap-inspired sunny pop star better slow down soon or a round of rehab may be right around the corner. 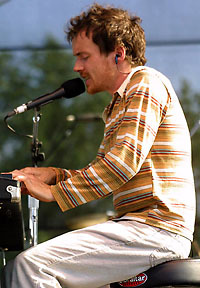 Though the ongoing subject of major buzz, troubadour Damien Rice came across as nothing more than a whiny version of Dave Matthews (crossed with a cat wincing in pain), despite versatility on both guitar and piano. Ween continues to attract a cult-like following, but the band requires an extremely acquired taste that still steers clear of the mainstream masses. And then there was pirate-themed cabaret rockers Gogol Bordello, who also have a devoted underground following, but were the live equivalent of someone telling an inside joke to an outsider. Even with a handful of missteps (and that red hot heat), the latest installment of Bonnaroo boasted one of the most impressive rosters in recent festival memory, while also attracting a generally chilled out audience. The positive vibes resonated throughout the spacious campgrounds- from the first act to the dusty exit trail- and given its track record thus far, it could quite possibly become the annual Woodstock experience for this generation. 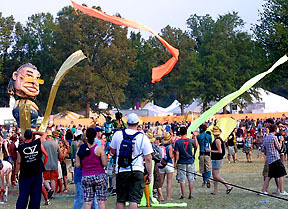 Bonnaroo Photo Gallery - Check 'em out!